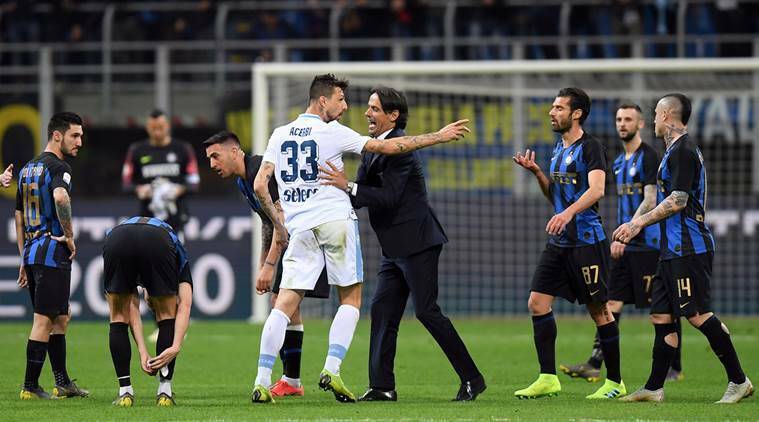 Lazio threw the race for Champions League places wide open when an early Sergej Milinkovic-Savic goal gave them a 1-0 win at third-placed Inter Milan in Serie A on Sunday. The Serbia international stunned the San Siro when he caught Inter midfielder Marcelo Brozovic off his guard to head in at the far post from Luis Alberto’s cross in the 13th minute. Lazio’s win took them to fifth on 48 points with Atalanta, one ahead of AS Roma and three behind fourth-placed AC Milan — who lost 1-0 at Sampdoria on Saturday — with a game in hand. Inter Milan have 53 points and only eight separate them from ninth-placed Sampdoria (45). The top four qualify for next season’s Champions League. Inter were again without forward Mauro Icardi, who has not played since he was stripped of the captaincy in mid-February and then complained he had a knee injury. The Argentine returned to training this week but was surprisingly left out by coach Luciano Spalletti. Inter had more possession but created few real chances and could easily have lost by more. Their keeper Samir Handanovic kept Lazio’s halftime lead to a single goal by blocking a Bastos header at point-blank range and turning away Luis Alberto’s effort with a one-handed save. Handanovic then made a brilliant double save in the second half, first denying Felipe Caicedo after the Ecuadorean burst through the Inter defence and tried to chip the keeper, and then foiling Ciro Immobile from the rebound. In the other evening match, Bologna moved out of the relegation zone when Mattia Destro scored in the sixth minute of stoppage time to give them a 2-1 win over visiting Sassuolo. Substitute Erick Pulgar had put Bologna ahead with a penalty, his first touch of the game, before Jeremie Boga levelled two minutes into stoppage time. Destro was then brought off the bench and headed in from a corner to lift Bologna to 17th on 27 points, two above Empoli who lost 1-0 at runaway leaders Juventus on Saturday. Inter Milan coach Luciano Spalletti said the club had been humiliated by striker Mauro Icardi as he explained why he left the Argentine out of the team for Sunday’s Serie A match at home to Lazio. Icardi was stripped of the captaincy in February after being embroiled in protracted negotiations over the renewal of his contract and the 26-year-old then said he could not play because of a knee problem. Icardi, Inter’s leading scorer in each of the last four seasons, returned to training this week after a meeting between his lawyer Paolo Nicoletti and the club and was expected to face Lazio but was surprisingly left out by Spalletti. Spalletti said that “the events have happened in front of everyone and are easy to interpret. Spalletti added that Sunday’s defeat by Lazio after Sergej Milinkovic-Savic’s early goal was not due to Icardi’s absence. “How many defeats, worse than this one, have we had with Icardi on the pitch?” he said.